This garden is one of the most romantic in Lisbon. It’s not a big one, but it is so cozy and so resplendent you really don’t care about its size. 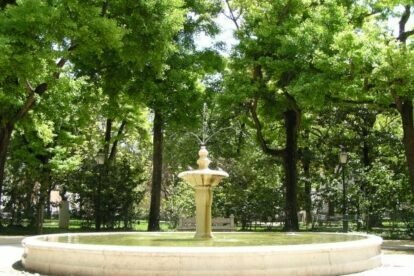 It’s wonderfully designed, being a perfect square with its tall trees and a graceful fountain in the middle. iI was inaugurated by order of Marques de Pombal in 1771, the same guy who helped to rebuild Lisbon after the great earthquake. I personally love visiting this garden at night, when it is very quiet and kind of gothic, owing to the old and impressive Águas Lisbon Aqueduct and to the small church underneath it, “Ermida Nossa Senhora de Montserrat”. As every decent garden does, Amoreiras Garden also houses an adorable renovated Bistro. Coincidentally, every time I go there, I meet a lot of French people, what makes me wonder if the french guys are always attracted by the best cafes… Probably the reason is the Portuguese pastries they sell there, for they are delicious and not exaggeratedly big, which I love. And also in front of Amoreiras garden there is a interesting museum to be visited, the Arpad Szenes-Vieira da Silva Museum, located where it used to be an old Silk factory. More reasons I love this garden? It’s close to the Mãe D’Água Amoreiras Reservoir, the Procópio Bar, Rato’s metro station, Amoreiras Shopping and it’s surrounded by a lovely neighbourhood. And best of all, it’s very close to where I live.